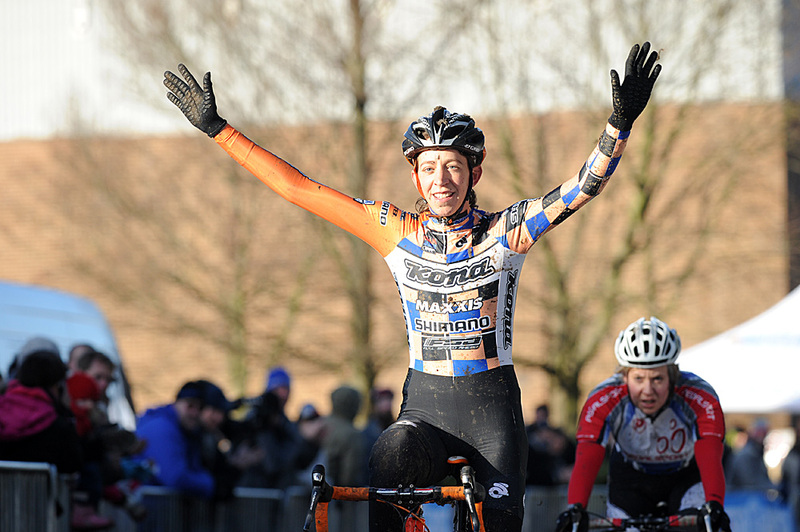 Helen Wyman and Ian Field continued their impressive run of results in the USA last weekend at the Rohrbach’s Ellison Park cyclocross in Rochester. British national champion Wyman (Kona Factory Racing) led the women’s event from start to finish. The win at the C2-rated event – her sixth of the season – gives her more valuable ranking points before she returns to Europe to build her form in preparation for the World Championships, which form the focus of her season and take place in late January. In a mudbath of a men’s race at the Nor’easter cross last Sunday, Ian Field (Hargroves Cycles) rode away from rivals Tom van den Bosch (AA Drink) and Nicolas Bazin (Bigmat-Auber 93). Field also placed second in the men’s race in Rochester, losing out to Bazin on that occasion. It augurs well for Field’s European season too. He and Wyman will soon return to their Belgian bases for the first round of the Superprestige series in Ruddervoorde. Team UK Youth has added experienced British rider Yanto Barker to its squad for 2012. More signings are expected to follow for UK Youth this winter, as part of the squad’s push to gain a UCI Continental license in 2012, which would make them part of the sport’s third tier. ‘’I’m very pleased to have signed for the UK Youth team,” said Barker. ”We are really glad to have a rider of Yanto’s experience and calibre joining the team for 2012″ Backstedt added in the team press release. Celebrating its 100th year of existence, UK Youth is a leading national youth work charity supporting over 750,000 young people. Sigma-Sport Specialized is putting the finishing touches on its 2012 roster this week amidst a tight squeeze in the transfer market that is putting pressure on all British teams. Joining the fold is promising youngster and last year’s U23 British time trial champion, Andrew Griffiths. He will join Twenty 3C-Orbea teammate Marcel Six there, who moved across in late August. Having this week secured the services of talented British riders Simon Richardson, Tom Murray, Tom Last and Steve Lampier for another year, team manager Matt Stephens told Cycling Weekly the squad is looking to build on the experiences of last year. “It’s a nice feeling seeing the same riders take the step up to become the main protagonists in races”, he explained. At the same time, he indicated the team was busy speaking to riders about joining Sigma. “It’s a challenge to keep hold of riders,” he added, with wages fluctuating and significant changes in line-up taking place within the bigger teams such as Rapha-Condor-Sharp and Motorpoint. The team ran a dual programme this season which included UCI 1.2 races on the continent on top of British events. However a heavy crash in Paris-Troyes, that brought down a number of Sigma riders and saw Stephens seriously injure his knee, left the team weakened for the Premier Calendar racing that is Sigma’s bread and butter. Next year, the focus is clearly on the British Premiers, the Tour Series and the Ras. With several more riders in negotiations, the team looks likely to secure a strong squad by the end of this weekend’s Cycle Show. The Bicycle Film Festival is taking place this year from October 5-9 at the Barbican Centre in London. Now in its tenth year of running, the Bicycle Film Festival visits cities across the globe screening short films related to cycling. One of the standout films from this festival is set to be Sunchasers, a film documenting the lives of three disabled cyclists preparing for the 2008 Paralympics in Beijing. The film highlights the daily difficulties they face, in addition to the battle of competitive cycling. Another film that stands out for totally different reasons is Locomotive, focusing on an opera singer cycling around New York as a bicycle messenger. The funeral of John Partridge will be held at Kettering Crematorum on Wednesday October 5. Mourners are invited to attend the Rockingham Forest Wheelers clubrooms in Middleton, Northamptonshire afterwards. A former Honorary Treasurer of the British Cycling Federation, Partridge died suddenly on 27 August 2011, aged 82, after a period of ill health. Partridge was awarded the Federation’s Gold Badge in recognition of his contribution to the organisation, and also served as an international race commissaire over three decades. Partridge was also the founder and life member of the Rockingham Forest Wheelers. An obituary will appear in the October 6 edition of the Cycling Weekly.